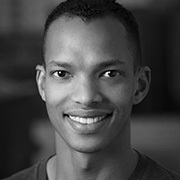 Christopher Adams is currently a member of Zvidance and Susan Marshall & Company in New York City. He is excited to be working with Swedish choreographer Pontus Lidberg on his new work this upcoming season. He was the Associate Choreographer on The Lion King: Concert in the Wild for Disney starring Viola Davis commemorating the 20th anniversary of the motion picture, and also the opera MAGDALENA at the Teatre du Chatelet in Paris. He has performed in several productions at the Metropolitan Opera from 2009 to present. Past credits include Cedar Lake Contemporary Ballet where he had the opportunity to perform works by Didy Veldman, Jill Johnson, Stijin Celis and Ohad Naharin to name a few. He has also worked with dance companies including Sidra Bell and Compagnie Julie Bour. He and his brother Warren Adams recently formed AdamsWorks, a company focused on producing original works in South Africa and the USA in both traditional and non-traditional settings, using movement as their main vehicle to challenge themselves and their audiences. Christopher Adams trained at the Toynbee Ballet School and the National School of the Arts in South Africa. He performed with the South African Ballet Theatre and received the Linbury scholarship to study at Rambert School in London.